Is your watch broken? Do you need to get your watch fixed? Are you looking for a New York-based watch repair shop? 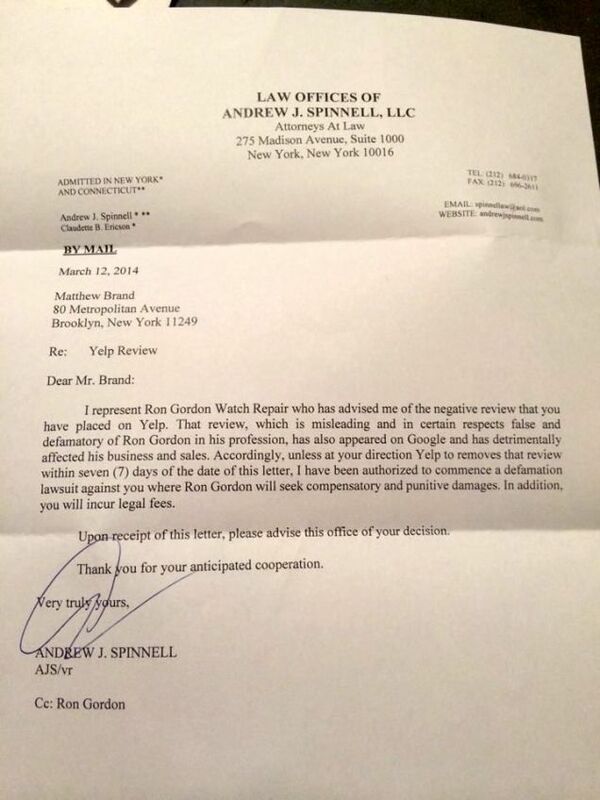 You should probably skip Ron Gordon Watch Repair, because he's so bad at fixing watches, he's threatening frivolous, insane lawsuits against critics. I went to Ron based on the positive reviews here, and while he and his associate are nice people, I cannot recommend them based on my experience. I had two watches to repair - an Ebel and a vintage pocket watch. I was told it would be a week just to get an estimate. This seemed like a long time just for an estimate, but fine. I waited over a week and decided to call and check in - I was already annoyed that they had not called me. The pocket watch, I was told, was too old - the part that was needed was no longer in existence. The Ebel could only be fixed by the manufacturer and would need to be sent out, which they could do (Ebel would take over 8 weeks to repair). When they told me it would be $45 to send it out, I decided against it, and just picked up the watches. This is where Ron really lost points. I took both watches to a place called Precision Watch Repair, right around the corner, which had good ratings here on Yelp. I met with Eric, who told me first that he definitely could fix the vintage one, and also that he could repair the Ebel without sending it out - all for a good price. The Ebel was repaired in a day. I went from hopeless to happy within a span of 15 minutes. In addition, Eric called me THAT DAY with the estimate, and followed up the next day. So Ron Gordon loses in terms of creativity, and just overall slowness....which seems appropriate for a review of a watch repair shop. Nobody likes to get a negative review, and it's even worse if you think it violates your legal rights. But a good lawyer will tell you the truth: defamation suits are notoriously expensive and difficult to win. Worse, they are very public. We can point to countless examples of ill-advised lawsuits that hurt the business far more than it ever helped.